Faith Ringgold, began her artistic career more than 35 years ago as a painter. Today, she is best known for her painted story quilts — art that combines painting, quilted fabric and storytelling. She has exhibited in major museums in the USA, Europe, South America, Asia, Africa, and the Middle East. She is in the permanent collection of many museums including the Studio Museum in Harlem, the Solomon R. Guggenheim Museum, The Metropolitan Museum of Art, and The Museum of Modern Art. Her first book, Tar Beach was a Caldecott Honor Book and winner of the Coretta Scott King Award for Illustration, among numerous other honors. She has written and illustrated eleven children’s books. She has received more than 75 awards, fellowships, citations and honors, including the Solomon R. Guggenheim Fellowship for painting, two National Endowment for the Arts Awards and seventeen honorary doctorates, one of which is from her alma mater The City College of New York. 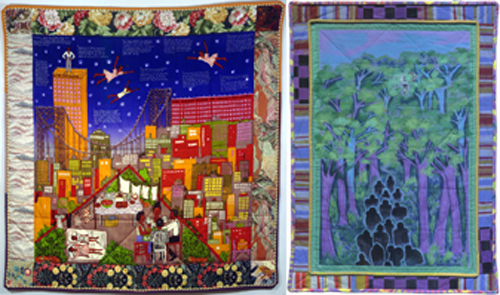 6:30 – 7:30 Lecture: Faith Ringgold in William Johnston Building, Room 2004. In conjunction with In Our Steps, A Preview Exhibition, as part of the on-going Curatorial Collaboration by Art Teachers in Leon County, titled Generations.